A tourist in Bali was knocked off her feet by a strong wave as she posed for photographs in front of the raging sea. 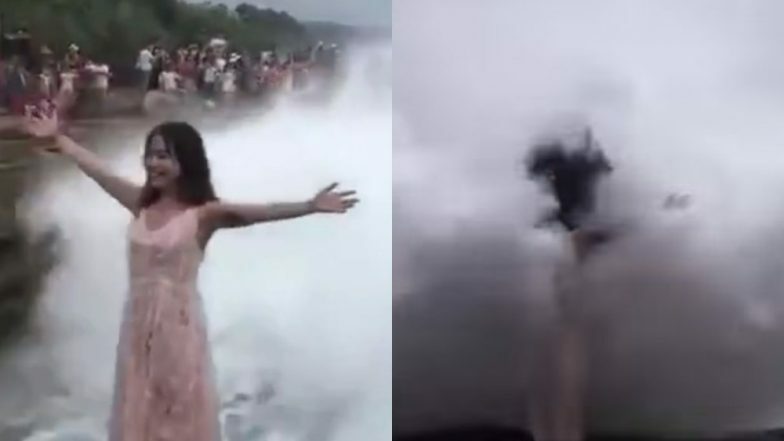 Video of the shocking incident which has going viral on social media shows the girl almost flying away after a wave hit her. The clip shows her standing with outstretched arms while a wave swells in the background and sweeps her off feet. Onlookers can be heard screaming on seeing the sight. The woman survived the terrible accident but was left with bruises and cuts across the body. The footage was shared massively on Chinese social media with people terming the woman lucky to have been saved such an accident. The incident happened at Rocky coast in Nusa Lembongan island, Bali. It seems there were no safety measures to guide tourists visiting the region. American Grandmother Posing on Iceberg Tossed by The Wind to Sea; Her 'Misadventure' Pictures Go Viral. It was another video of the woman which was also shared widely on social media which clarified that she was saved. It seems she fell by a rock that left bruises on her body. The video showed a man pouring water on her cuts in an attempt to clean it. She was completely soaked and visibly shook by the incident. The identity of the woman remains unknown. A TripAdvisor's review on the place reads, "We were there one week ago and there are absolutely no warning signs that every area beyond the immediate vicinity of the parking area is extremely dangerous. We were coming from Dream Beach walking along the cliffs towards Sandy Bay beach. Nowhere near the edges but a giant wave swept our children against the rocks requiring our [10-year-old] son to be taken to hospital with serious cuts requiring several stitches."